My toes curled when I took my first bite of French bread – a baguette, still warm from the oven. Even years later – hundreds of baguettes later – I could not understand how my French friend, Julie, was able to restrict herself to one slice with dinner. 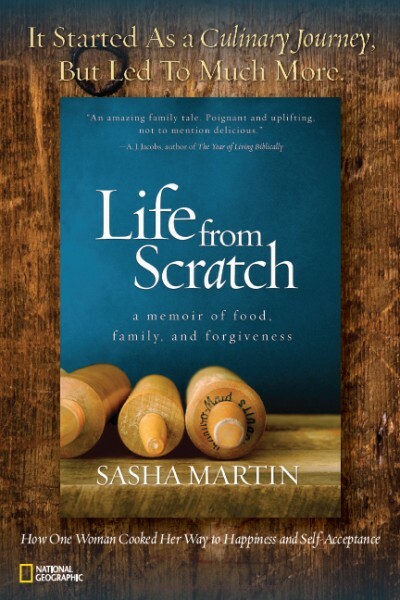 Her entire family was that way – they’d had good bread their entire lives. I was unable to be so moderate. Entire baguettes could disappear into my belly in an afternoon. I gained 15 pounds living in Paris, around the skinniest girls in the world. In college I wrote a hundred pages all about the history of artisan bread in France. I was obsessed. The good news is I learned how to make pretty awesome bread at home. It takes 3 days, but each step is easy. There are two things which make French bread so amazing. 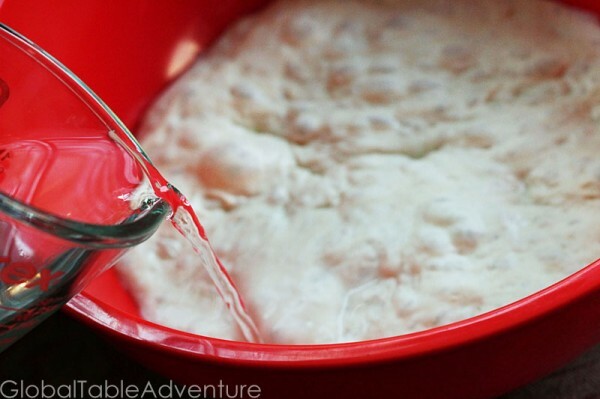 1) Flavor: Mixing the yeast with a little flour and water ahead of time gives a big flavor boost. This is called a poolish or preferment. Slow and cool yeast development is the secret to good flavor. 2) Texture: Achieving a soft interior and thin, shattering crust. You do this by adding moisture while baking and using steady, high heat. A spray bottle and baking stone are the best we can do in our homes. 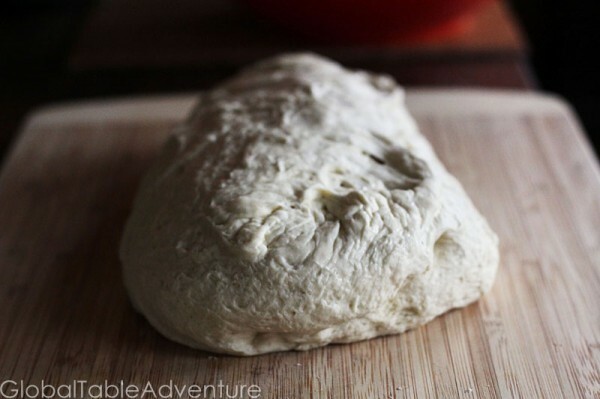 This recipe is an adaptation of a King Arthur Flour bread recipe. I’ve been tweaking it for years. I changed into my pj’s and was all settled in to read The Sweet Life in Paris before I remembered – oops! Time to make the poolish (starter). 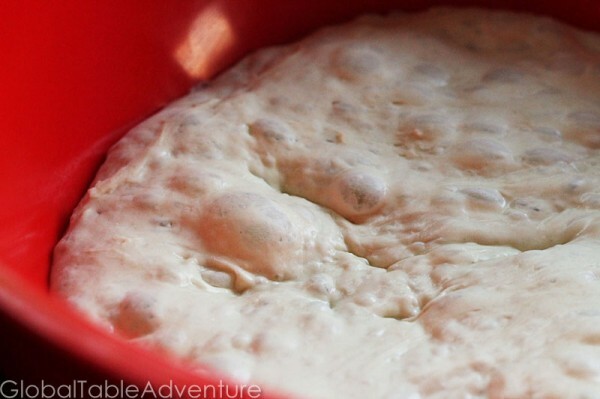 To make the poolish: In a large bowl, thoroughly mix together 2 cups flour, 1 cup cool water, and 1/8 teaspoon yeast. Cover with a damp towel and let sit in a cool spot for 14-24 hours. It’ll be thick and doughy. Keep cool! Try in the basement, by a drafty window, or over a bowl of ice. I climbed back in bed and read until sleep overtook me. That was easy! Ran a few errands. Put the baby down for a nap. I took a peek at the poolish, but decided to garden a little before messing with it. Apparently you can’t actually plant anything new until you remove the leaves and weeds from last year. Gave up on gardening for a little while. When the poolish is 2-3 times larger and full of bubbles, add 1 tsp yeast, 1 1/2 tsp salt, 3 cups flour and 1 cup water. Place in large bowl and cover with damp hand towel. It looks so different from yesterday! 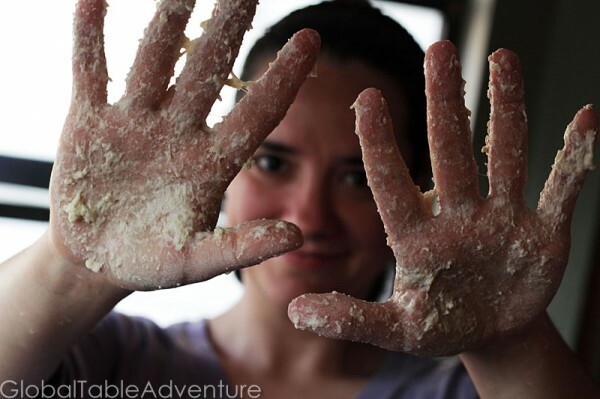 Let’s make a dough ball! I like to mix it with my hands. It’ll be really, really sticky. Flop it around a bit. 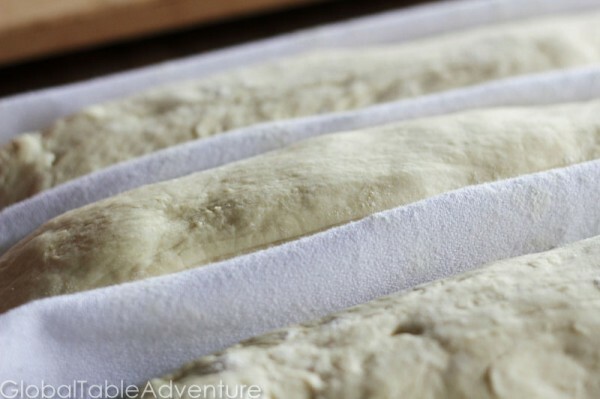 This is the “slap and fold method” which works great for wet doughs. After a few folds, it won’t stick any more. After about ten folds, get most of the goo off your hands and see if it is still sticky. If it is, work in extra flour. You’re looking for a very soft, moist dough. But not sticky. 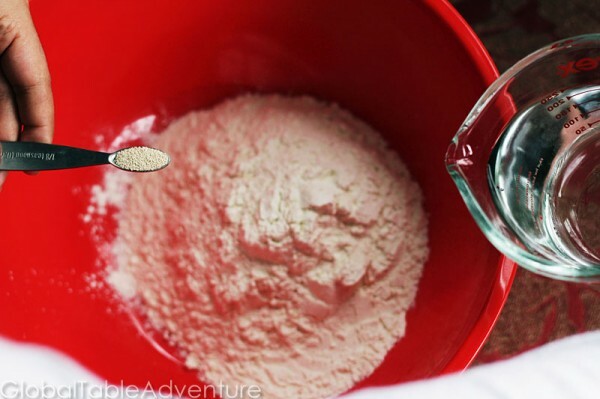 If it is a rainy day – or humid – you will definitely need more flour. 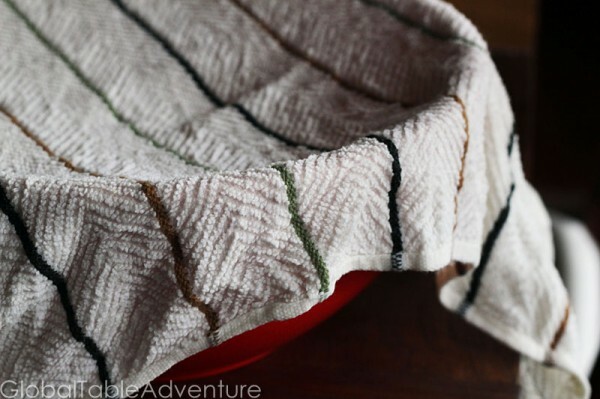 Cover with a damp dish towel. Place over a bowl of ice if you don’t have a cool spot. Had a relaxing night not thinking about bread. Ate grilled salmon, watched Bill Cosby, Himself. Laughed a lot when he was talking about parenting. Drank a little wine. Ran over to sniff the bread dough before heading to bed. Smelled great! Morning – about 9 am. Woke up to miss Ava toddling into my room. We jumped on the bed for a few minutes. 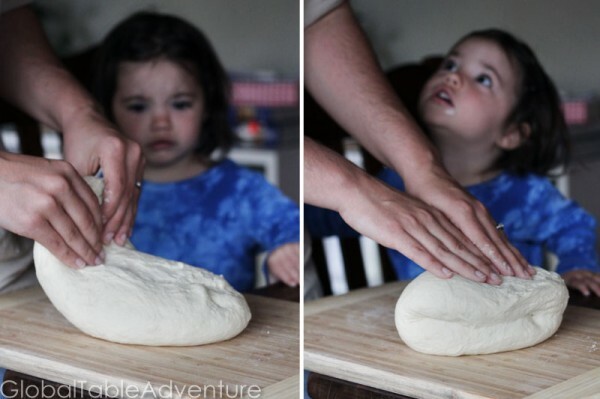 Next up – a few minutes of bread making. 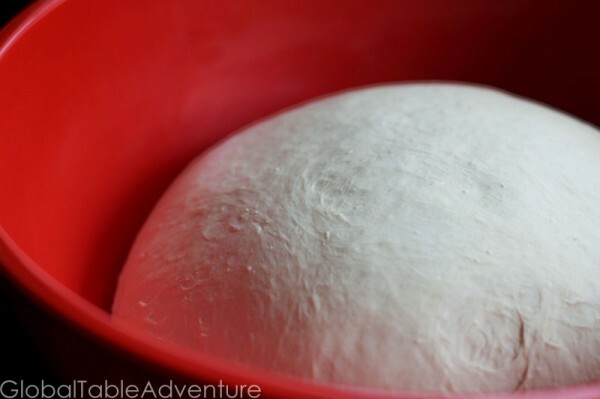 Take the dough out of the bowl, slap it around a few times, shape into a ball. Return to bowl, cover it back up with damp hand towel. 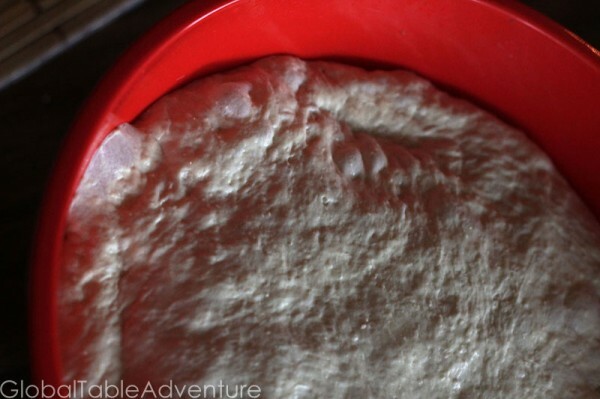 Here’s the dough after resting overnight. The dough is full of bubbles and giant. It should be airy and soft. And should easily form a smooth ball. It’s already so different from yesterday – the gluten has developed. Slap it down and fold it a few times. Put it back on the bowl, covered with a damp towel, in a cool spot (or on a bowl of ice). Next I ate breakfast. Went to baby dance class where we pretended to be elephants and turtles. There was much spinning and clapping. Turn it out of the bowl… there are tons of bubbles, Yay! 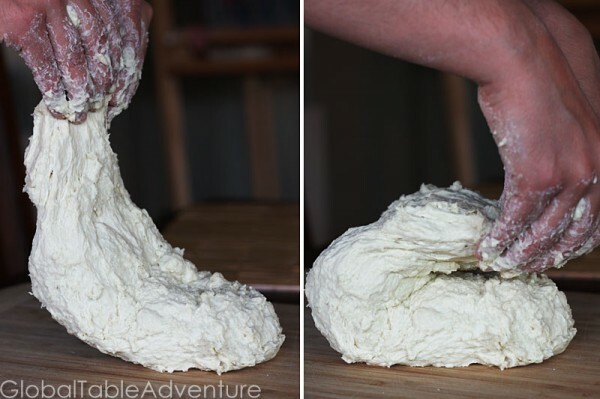 Cut the dough into 3 pieces and shape into logs. Let rest 20 minutes. Try not to disturb the holes. Be gentle at this point. Put baking stone in oven and preheat to 450F. Slit with a razor, spray with water, and bake at 450F until cooked – about 20 minutes. 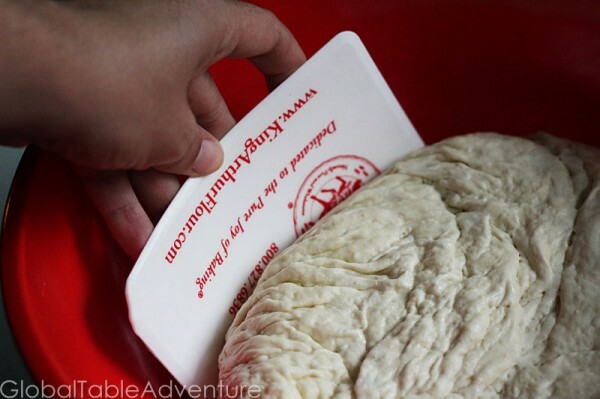 Bake directly on stone or baking sheet. Eat with French Onion Soup or Ratatouille. Or all by itself with a view of the garden. Or weeds. Whatever the case may be. This is your passport to Paris, enjoy! There are two things which make French bread so amazing. 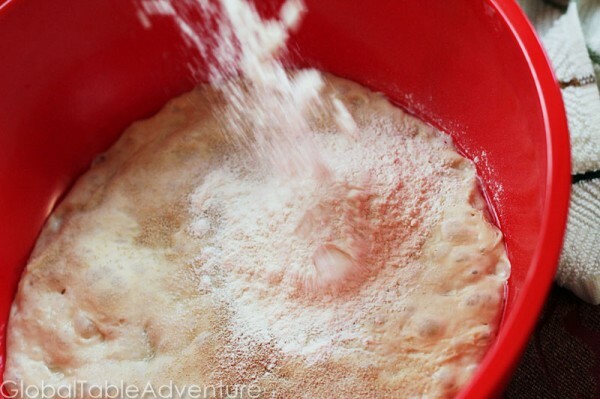 1) Flavor: Mixing the yeast with a little flour and water ahead of time gives a big flavor boost. This is called a poolish or preferment. Slow and cool yeast development is the secret to good flavor. 2) Texture: Achieving a soft interior and thin, shattering crust. You do this by adding moisture while baking and using steady, high heat. A spray bottle and baking stone are the best we can do in our homes. 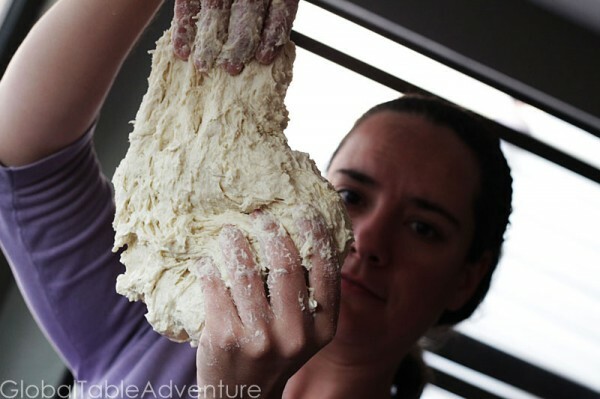 This recipe is an adaptation of a King Arthur Flour bread recipe. I’ve been tweaking it for years. When the poolish is 2-3 times larger and full of bubbles, add 1 tsp yeast, 1 1/2 tsp salt, 3 cups flour and 1 cup water. 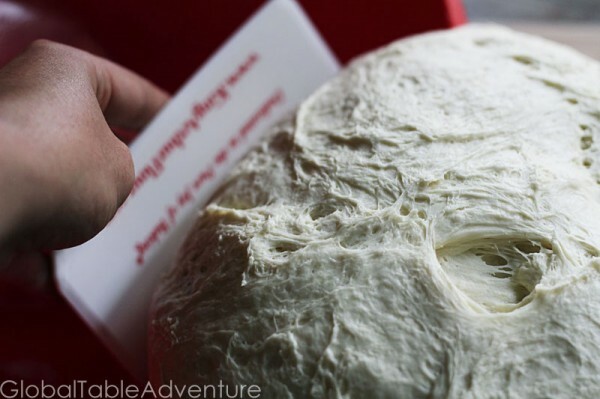 Use the slap and fold method to form a dough ball. After a few folds, it won’t stick any more. After about ten folds, get most of the goo off your hands and see if it is still sticky. If it is, work in extra flour. You’re looking for a very soft, moist dough. But not sticky. 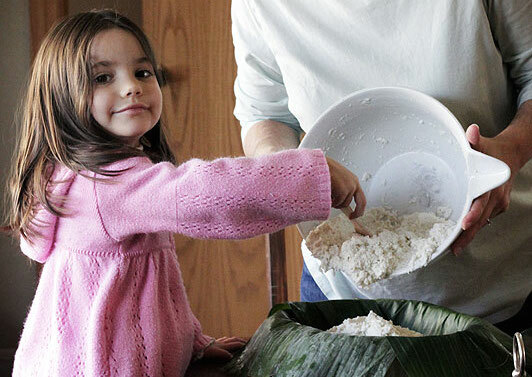 If it is a rainy day – or humid – you will definitely need more flour. 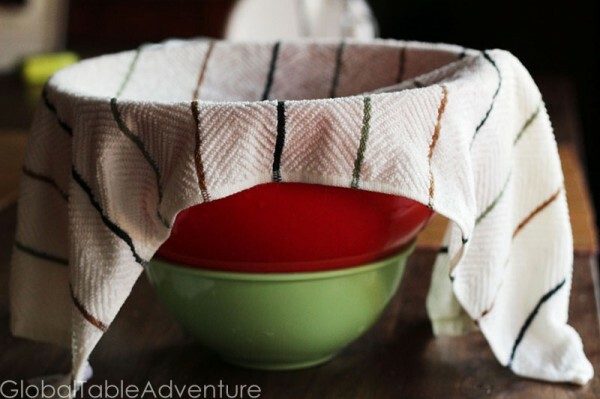 Place in large bowl and cover with damp hand towel. Place over a bowl of ice if you don’t have a cool spot. 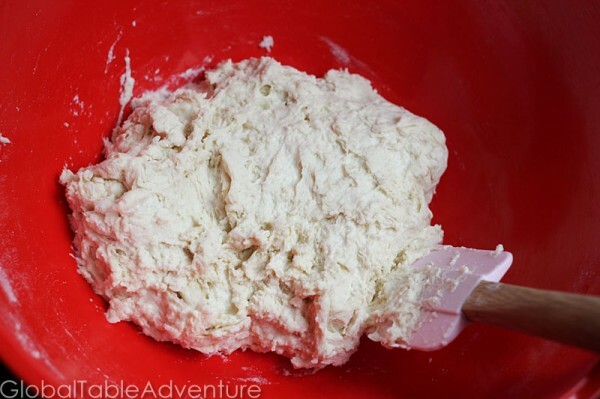 Take the dough out of the bowl, slap it around a few times, shape into a ball. It should be airy and soft. It’s already so different from yesterday – the gluten has developed. Return to bowl, cover it back up with damp hand towel for 3 hours. 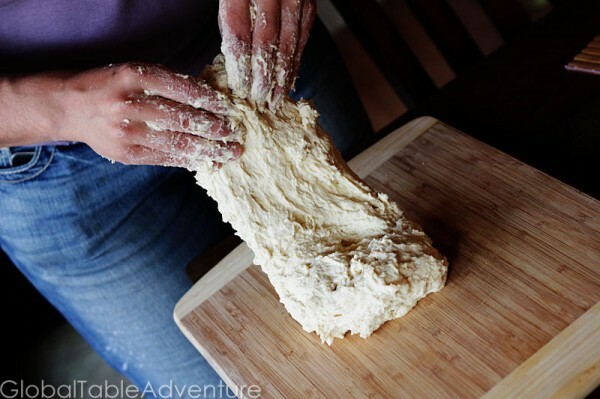 Cut the dough into 3 pieces and shape into logs. Let rest 20 minutes. Try not to disturb the holes. Be gentle at this point. Put baking stone in oven and preheat to 450F. This was a really great batch. Every day is different – depending on the humidity and temperature. You have to work with it’s personality on that particular day. I’m fairly new to it- I still enjoy baking, I just give it all away to my friends. It’s a great way to make new friends! That’s so sweet. Sometimes I wish I couldn’t eat it because I always overdo it. Have you been to the gluten free girl’s web site? She has a lot of neat recipes, even for baking. Very very few people are actually allergic to gluten (about 1 in 10,000). More people find they are slight intolerant to ‘fast bake’ bread which goes from raw ingredients to supermarket packed in less than three hours. Three day bread is pretty much digestible by anyone. I remember when I was a little kid and my dad told me, you can never get bread in the U.S. that’s anywhere near as good as the bread in France. (He and my mom had lived in Paris for a year.) Well now you can. I think this is one of your best posts. It was written with love. Thank you Brian, that means a lot. Also, thank you for being such a devoted reader. I loved this post! Great reading, great pictures. And it reminded me how lucky I am to live just next door to a bakery that won the “best baguette in Paris” award a few years ago. Ennerving as daily life in Paris can be (like in any big city I guess), a warm baguette, a stinky cheese and a bottle of wine can always make me forgive anything. Mette- just for the record, I’m totally jealous. I wish I had a bakery like that next door! France at last! My favourite culinary place. 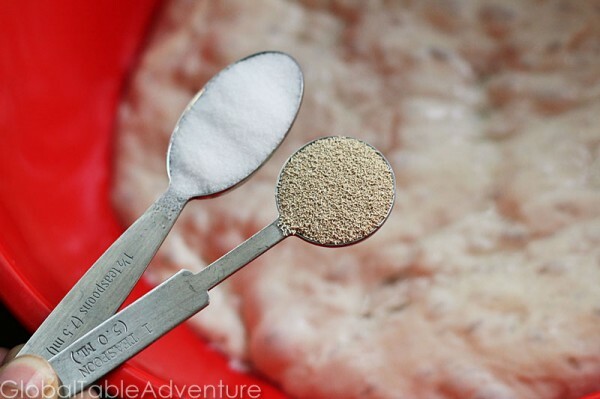 Thanks for this interesting post on French bread Sasha and thanks too for showing the King Arthur dough scraper so clearly. I’ve been hunting for one of these for some time and though I have seen some online I have been unsure whether they were exactly what I was after so I haven’t taken the risk. You picture one that does exactly what I need so I have been in touch with Kng Arthur (which is US not UK) and hope they can supply me here in London. As for the French bread, I have a proper tin in my cupboard so I really ought to have a go, though if the dough is as sticky as when I made brioche I would do well to wait for my scraper to arrive! Looking forward to seeing what French recipes you make – so many to choose from you could have several weeks worth of material. I’ve heard back from King Arthur flour about the scraper. Cost of scraper $1.95 (or £1.95 depending on where you read on the site) – cost of postage from USA $36.50. Just not worth it, obviously! That’s wild! International shipping is very expensive. They should have them at any good cookware/baking shop. Maybe ask your favorite bakery owner where they got their plastic scrapers. This is as beautiful as it is scrumptious. Now I have a homemade bread that pairs perfectly with au jus: http://twitpic.com/4dmimc (next photo will have homemade bread, not store bought!). This is so different from the milk/egg/yeast breads I make. 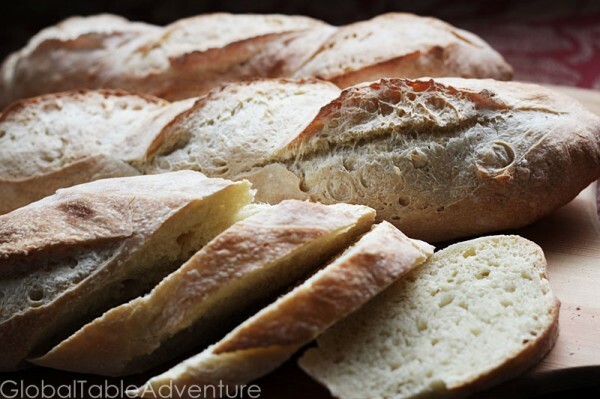 French bread is so simple, so good. Thanks Karen – looking forward to seeing your creation. The au jus looks scrumptious. Tried this bread recepie this weekend (even though I have never baked bread in my entire life). It turned out really well, and I couldn’t believe how crunchy the crust was, even directly out of the oven. Amazing. Thanks for this recepie! Yes, but that would involve planning 3 days ahead and starting the recepie. I am not normally that organized when it comes to potlucks! Thanks for this recipe – I usually just read, admire, and say “I must try that someday”. This one got me going straight to the kitchen. Three days later, turned out several amazing loaves, and it was such fun to make. Thank you from the whole family here! Second batch just out of the oven, third batch started for a couple of days time…Just curious, have you ever tried this recipe with wholemeal flour? I assume one would have to up the water, and possibly the yeast quantities. I’m on day two, but trying to think ahead a bit. I’ve never had bread turn out perfectly. 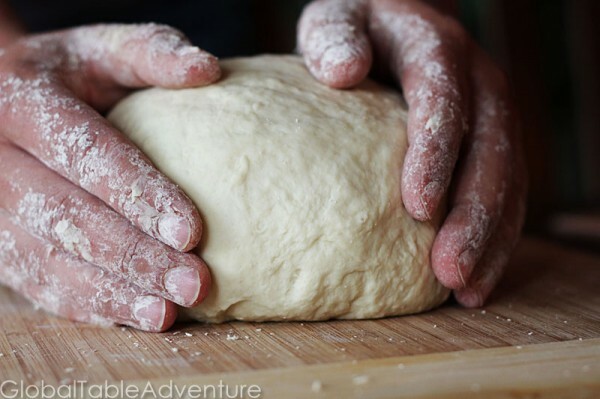 How do you get the dough “gently” from its resting space to the hot baking stone without disturbing the holes? Thanks! I ended up using a cornmealed piece of parchment paper. It worked beautifully. This is a great recipe. Yeast bread and mashed potatoes have always been my achilles heel, but this was delicious! Thank you for the confidence! 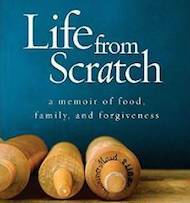 I just finished reading your book and this was the first recipe I tried (second was the torta di riso – fantastic!). Thank you so much, my whole family loved this bread and I will make it again and again I’m sure. I’m a huge new fan! I’m on Day 2 of this recipe right now & can’t wait to see how it turns out! Very little kneading involved and it turned our perfect. Definitely a keeper, thanks so much for the recipe! Does it matter what kind of bowl I make the dough in? I see in the picture you used a plastic or a ceramic bowl, would it be okay to use a metal bowl?